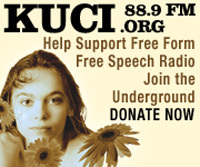 Dedicated to presenting the full range of views on local, state, national and international issues to an expanding community of listeners, KUCItalk's spectrum of featured guests include newsmakers, authors, comedians, actors, directors, artists, musicians, scientists and politicians. Climate Science Legal Defense Fund director Lauren Kurtz, Michael E. Mann, Greg Palast, Paula Poundstone, Sandra Tsing Loh, George McGovern, John Doe, Garrison Keillor, John Irving, Michael Chabon, Billy Collins, Stephen Dunn, Elizabeth Strout, Geraldine Brooks,Triumph the Insult Comic Dog, Joseph Wilson, Janeane Garofalo, Anne Lamott, comedian Jon Lovitz, Paul Krugman, David Lynch, Errol Morris, John Sayles, Ray Bradbury, Tippi Hedren, Ian Anderson, Merrill Markoe, Cesar Chavez, and Monty Python's Flying Circus have all been guests of KUCI. This week's special guest is Kirsten Vangsness ( Penelope Garcia on CBS's Criminal Minds).